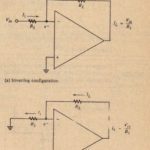 A transconductance amplifier is basically a voltage-controlled current source. As shown in Figure 15-28. the amplifier typically has a differential input and singleended output. Recall that transconductance is defined to be output current divided by input voltage. The transconductance of the amplifier. A programmable transconductance amplifier is one whose value of gm is determined by the value of an externally supplied control current or voltage. In the programmable transconductance amplifier shown in Figure 15-29, the value of gm is controlled by t:1C value of amplifier bias current, IARc• A programmable transconductance amplifier can be used to construct a programmable voltage amplifier, that is. an amplifier whose voltage gain can be controlled electronically. The next example illustrates this application. 1. Determine the voltage gain of the amplifier as a function of IABC. 2. For what value of IARC will the voltage gain of the amplifier equal 15? Another application of a programmable transconductance amplifier is its use as a programmable resistor: a resistor whose resistance is determined by an external control voltage or current. Figure 15-31 illustrates this perspective. Suppose that the relationship between.